Today, we all know the facts that have come to our attention since the G20 police crackdown, but to the best of my knowledge, no police department has ever apologized for the black-shirted, baton wielding assault of our constitutional rights. "So why didn't these idiots just stay at home? What were they trying to prove?" I patiently tried to explain to my friend that we live in a free democratic country and we have a right to get involved in a peaceful protest. "What are you talking about? Did you see the burning police car? That was no peaceful protest, my dear!" My friend's voice sounded slightly acidic and took on that snarky I'm-way-more-informed-than-you tone. I stared at my feet in silence. This conversation took place almost a year ago. Today, we all know other facts that have come to our attention since the G20 police crackdown. The police beat many innocent people with their batons. The police first denied and then admitted that they shot rubber bullets at the protesters. The police also made up their own arrest and detention laws as they brought down the hammer on our collective civil liberties. For those of us who have experienced brutal oppression brought on by a police state in other parts of the world, we simply could not believe that this scene was actually unfolding in downtown Toronto. I continually winced as I saw the police batons viciously rise and fall on the cowering bodies that had their hands up in the classic act of total physical surrender. The state was clearly the master. We were clearly being told to be the obedient servile servants. As an experienced Toronto criminal lawyer I have defended many individuals accused of serious gun related crimes. A "typical" club shooting, for example, involves two groups of young men who take out their guns and start shooting at each other. Innocent people who just happened to be at the club on a given night are sometimes shot and killed. What is always amazing is that when being interviewed by the police, around 50 or more individuals at the club claim not to have seen anything or insist that they were in the bathroom at the time of the shooting. When no witnesses come forward, the police publicly wring their hands about the lack of "community cooperation" or the lack of "trust" between the police and certain visible minority community groups. This wringing of the hands about cooperation and related blather about trust certainly did not apply to the police themselves when one of their own was being investigated in the aftermath of the G20 summit. No police officer who worked with Const. Glenn Weddell could recognize him as he allegedly beat a local Toronto man and shattered his arm. It would appear that some police officers took great exception to the fact that they were being photographed as they meted out their version of street justice. Eventually, there were two "failed" investigations. There was a supposed total lack of evidence. The Special Investigations Unit (SIU) investigated and interviewed at least 11 police officers who were working alongside Weddell during the incident. One of the interviewed officers was actually Weddell's roommate during the G20. Each and every one of these officers basically shrugged their shoulders and claimed that they knew absolutely nothing. They were all in the proverbial bathroom as this beating was going on. The truth appears to be that Const. Weddell was well protected within the thin blue line. Only when the local media got involved and conducted their own separate investigation, did the SIU finally do something meaningful and laid the criminal charge of assault causing bodily harm against Wedell. These are some of the facts for us to carefully examine. We as a society must acknowledge these harsh realities. We cannot turn simply turn away and pretend that these events never took place. During the G20 summit, our own government rubber-stamped secret laws that viciously and deliberately curtailed our freedoms. Our own government overspent millions of dollars turning downtown Toronto into an occupied war zone. In front of the whirring cameras, the police openly deployed a sadistic technique known as kettling. This brutal technique is designed to surround and corral a group of protesting citizens for a long period of time and eventually squeeze out the "criminal element." A colleague who watched the television coverage of the G20 called it a "police batting practice." To the best of my knowledge, no police department has ever apologized for the black-shirted, baton wielding assault of our constitutional rights. 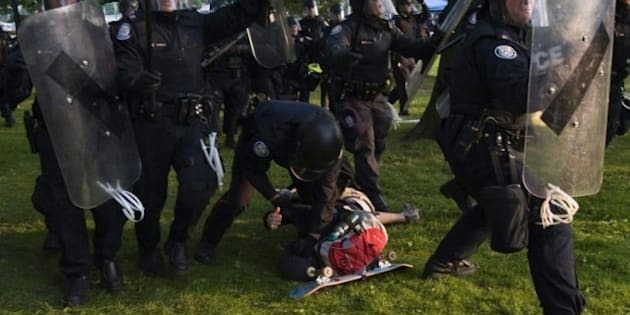 I am well aware that not all of the police officers involved in the G20 security enforcement acted in an illegal manner. Many of them no doubt tried to carry out their duties with restraint. My point is simply this: not one police officer stepped up from the thin blue line breaking rank and said, "This is wrong, this has gone too far, we are acting illegally." For a few days last year the police became an unthinking, blunt, crushing monolith for the state. In the upcoming weeks I am looking forward to hearing the representatives of the selective law and order agenda loudly resist any notion of a public inquiry into the police conduct at the G20. Canada is a great country. We are very fortunate to be living here. In my view we all should zealously stand on guard for our guaranteed rights and freedoms. The concept of freedom is fragile. There are those among us who think of the general public as nothing more than bleating sheep. There are those among us who truly believe that they are above the law because of their rank in the social order and the uniforms they are privileged to wear. In a united, strong voice we should advise these individuals: we will not submit to being kettled. We will not embrace your perverted sense of justice.